Another set of Feng Zhu "concept" ships, commissioned for an unspecified Wing Commander title following the release of Secret Ops. 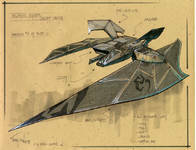 These Confederation fighters are unlike any seen in other games, although they may have been derived from the 'rotating parts' concept seen in Wing Commander Prophecy's Panther and Vampire. 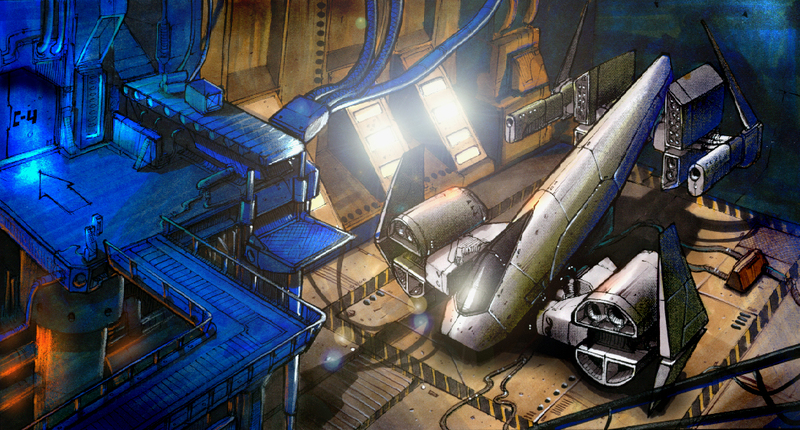 Their apparent modularity suggests that they may have been for Wing Commander Online - although we will see some other Feng Zhu artwork which clearly belongs to Shadow Force. 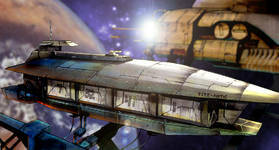 Another set of Feng Zhu "concept" ships, commissioned for an unspecified Wing Commander title following the release of Secret Ops. 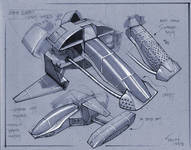 Like the fighters, these transports are unlike any seen before - several are built 'vertically' in an entirely unexpected manner. Note the attention to detail, including the artwork explaining how containers are stored in the first image! Another set of Feng Zhu "concept" ships, commissioned for an unspecified Wing Commander title following the release of Secret Ops. These are labeled as "multi-roles", which creates more questions than answers. 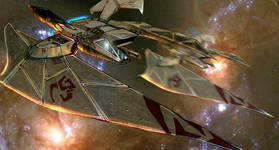 Thanks to the convenient scales they seem to be larger than fighters - but not by much. Could they be Privateer-style civilian warcraft? They do seem to be heavily armed! Another set of Feng Zhu "concept" ships, commissioned for an unspecified Wing Commander title following the release of Secret Ops. These images' filenames classify them as freighters while their labels identify them as multiroles - supporting the earlier theory that multirole refers to Privateer-style spacecraft. Regardless, this is another set of clearly Kilrathi designs. Another set of Feng Zhu "concept" ships, commissioned for an unspecified Wing Commander title following the release of Secret Ops. This fleet of ships runs the gamut, including Border Worlds designs of all types and even more Kilrathi freighters and multi-role ships. 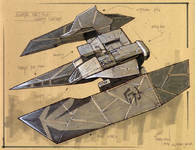 The Border World ships are interesting, with effort clearly being made to give them a separate and possibly non-human design aesthetic... the Kilrathi ships are classics, though, and could be placed anywhere in the Wing Commander universe. 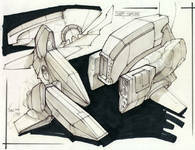 Another Feng Zhu "concept" ship, commissioned for an unspecified Wing Commander title following the release of Secret Ops. What we have here is one tough little image that didn't fit anywhere else -- it's not a blueprint, it's not a categorized concept sketch... it's just: something. In fact, that's all we can say, since it isn't labeled, either. More Confederation fighters? Multi-roles? Another elaborate freighter cargo storage system? A personal note: when I visited Origin back in October, 1998 these Feng Zhu pieces were arranged in a huge grid on a wall. Mike "Boomer" McCoy proudly showed them to me, but barred me from taking any pictures (not that my protoplasmic digital camera would have resolved enough detail in the first place...). 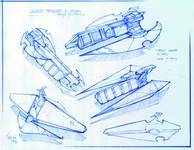 He said that his favorite was of a medical ship designed for Wing Commander Online -- if it exists, we haven't seen it yet! Still, it's absolutely amazing that this artwork which I assumed lost forever, could appear once again. 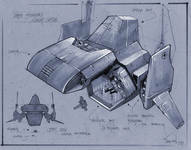 Another Feng Zhu "concept" ship, commissioned for an unspecified Wing Commander title following the release of Secret Ops. We've seen some impressive space ships -- strange Confederation fighters, classic Kilrathi designs, massive freighters, deadly cruisers... now what's the next step? Put them all together and see what they look like in action! 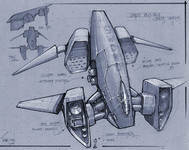 Here we see what a Border Worlds fighter might have looked like in the living, breathing Wing Commander world. 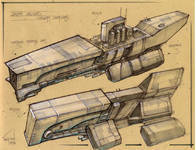 Another set of Feng Zhu "concept" ships, commissioned for an unspecified Wing Commander title following the release of Secret Ops. This set of 'action' concept art is designed to show what Zhu's new Confederation designs might look like in the game itself. From left to right: a cruiser, a fighter and a freighter. Another set of Feng Zhu "concept" ships, commissioned for an unspecified Wing Commander title following the release of Secret Ops. This is the third and final 'action' set, showing what four different Kilrathi designs could look like in an actual game. From left to right: a cruiser, a fighter, a freighter and a 'multirole' design. Another set of Feng Zhu "concept" pieces. Unlike the previous sets, the origin of these is clear: they are the characters developed for Wing Commander: Shadow Force, an aborted follow-up to Secret Ops. The first half of the cast are Confederation officers -- note the dynamic new uniforms, which give the old converted garbage-man outfits a run for their money. Another set of Feng Zhu "concept" pieces. Unlike the previous sets, the origin of these is clear: they are the characters developed for Wing Commander: Shadow Force, an aborted follow-up to Secret Ops. This second half of the cast seems to consist of mercenaries, privateers and other shady characters. They're a bit more varied than the Confederation crew... and occasionally a good bit sexier. Another set of Feng Zhu "concept" pieces. Unlike the previous sets, the origin of these is clear: they are the characters developed for Wing Commander: Shadow Force, an aborted follow-up to Secret Ops. These seven sketches represent six of the game's mercenary characters. From left to right: Furie, Hardware, Priest, Prime, Turk and Silver (the last two).